Learning how to ride a bike is a rite of passage for many kids. Riding a bike can provide children with a newfound sense of freedom and a healthy hobby they can enjoy for a lifetime. Taking those first tentative rides can be challenging for parents and kids alike, however. Today we’ll share a few of our favorite tips to make the learning a process a little easier. Make sure they’re ready and willing to learn. If your child isn’t excited about learning to ride a bike, you could be setting yourself and your child up for failure. Give your child time and space and let them choose when they want to learn. It’s typically much easier for children to learn when they’re enthusiastic about the prospect of riding a bike. Find a safe area to practice. 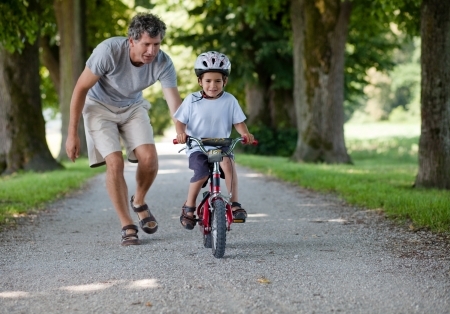 Once your child is ready to ride, find a safe, open space for them to practice. Ideally, you should find a long, wide stretch of flat pavement for them to ride on. An empty parking lot or cul-de-sac can give a child plenty of room to practice without having to worry about avoiding obstacles. Lend a hand at first. When you first start teaching your child to ride, gently hold onto the bike frame and let them know you’ll be there to catch them in case they fall. Just be careful not to interfere with the wheels or any other moving parts that might cause an accident. A little support goes a long way when you’re first learning how to ride. Learn when to let go. Some kids will be eager to start riding without the help of their parents once they feel like they’ve gotten the hang of it. Others will be more cautious and hesitant to ride on their own. Listen carefully to your child and use your best judgement to determine when they’re ready to ride solo. Once they start riding on their own, be sure to keep them supervised in case they take a spill as well. At Nantucket Bike Shop, we offer kids’ bikes for rent that are perfect for learning how to ride. To learn more, give us a call or stop into our shop on Broad Street today!